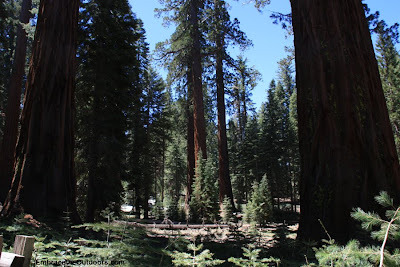 We had planned to head to Mariposa Grove and do a short hike on our camping trip to Yosemite. The Mariposa Grove has a lower and upper grove of Giant Sequoias and is in the southern part of the park. We made the drive from Yosemite Valley to the South Entrance of the park and parked in the nearby small lot. 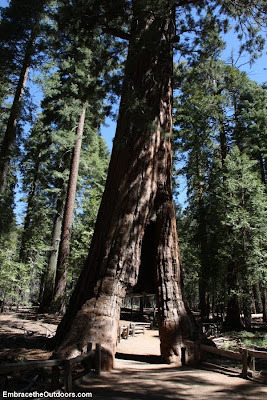 We waited for the free park shuttle to pick us up and take us down the road 2 miles to Mariposa Grove. We waited with a large crowd of people and when the first bus came through it could only fit 9 people so the rest of us had to wait for the second bus. After about another half an hour or so we made it to the grove. There is a parking lot right at the grove but it fills up early and apparently we didn't arrive early enough this day. There is also a gift/snack shop and restrooms. We had initially planned to do a hike of the Lower Grove and take the tram tour but the ticket office was closed with a sign that said that the tours were not running yet this season due to snow However, we never saw any snow while on our hike. After we realized we weren't going to be able to do the tram tour we grabbed a map and headed down the trail. The trail is all dirt and winds itself across the paved road that the tram uses. The first marked tree we came across was the Fallen Monarch which has been down for centuries. We kept on the trail and soon came to the Bachelor and Three Graces. This is a group of four Sequoia trees, one large tree surrounded by three smaller ones. 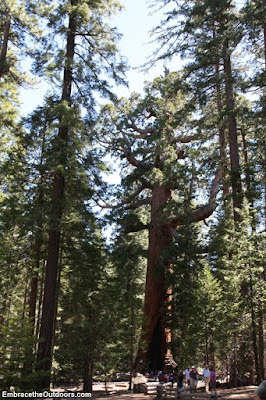 We made our way down to the Grizzly Giant which is one of the largest trees in the grove. The limbs of the Grizzly Giant are huge as well, the largest one being about 7 feet in diameter. We took our obligatory pictures and continued on. We came across a few wet areas on the trail before coming to California Tunnel Tree which was originally cut to let horse drawn carriages pass through. You can walk right through this tree and most people can’t resist the urge to do so, we couldn’t. Having time to spare we made our way uphill to the Upper Grove to continue on to the museum. It continued uphill with more exposed areas and the day was warming up. Eventually we made it to the museum but to our surprise it was closed. It wasn't just closed for the day but all boarded up from the winter season. It was pretty dissapointing that there had not been a notice somewhere else indicating that the museum was closed. There were restrooms nearby which were partially open. We walked around the area for a few minutes before making our way back. We made our way back through a different trail and passed through Clothespin Tree. 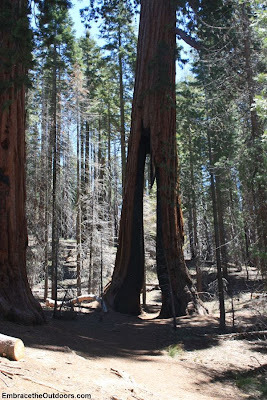 Many fires have excavated a hole at the bottom of this Sequoia which have made it resemble a clothespin, of course. Not much further down we came across the Faithful Couple. This is two trees that have grown into each other over the years, now sharing one large trunk. Across the way were two smaller trees that are starting to fuse as well. We continued on downhill under the shade of Sequoias of the lower grove until we got back to the parking lot. After making a quick stop at the gift shop we hopped on the shuttle back to our car. The trail to the museum was all uphill with about 800 feet elevation gain, the trail back down was downhill. Overall we did a 4 mile hike that took us about 2 hours. 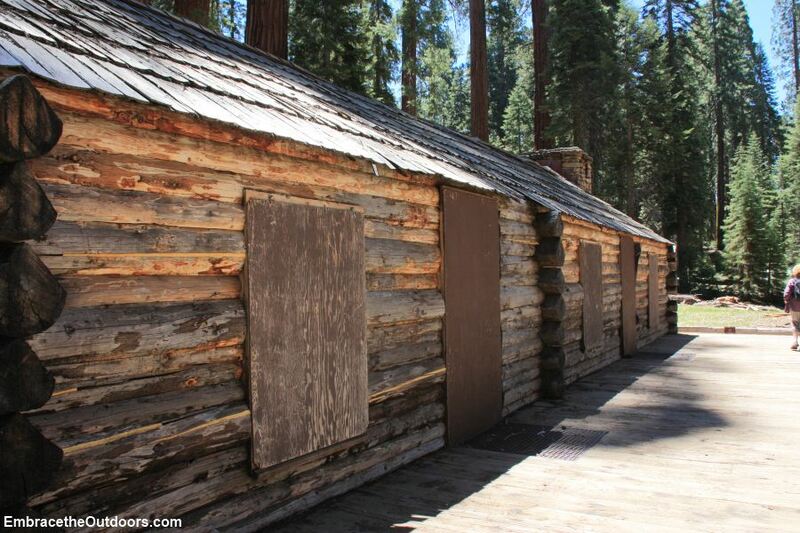 Although it was a nice hike with views of great Sequoias, it was dissapointing that the tram tour was not operational and the museum was closed. Not sure we will go back to this part of Yosemite. While camping at Yosemite National Park we decided to hike the Panorama Trail. The trail starts at Glacier Point and connects with various other trails. Our hike included the Panorama Trail and then connected to the Mist Trail down to Happy Isles in Yosemite Valley. The day before the hike we bought one way tickets for the tour bus that takes you from Yosemite Lodge up to Glacier Point. They have three tours per day, at 8:30am, 10am and 1pm. 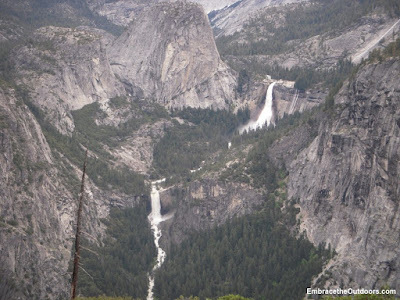 You can take the round trip tour that includes a tour at Glacier Point with bus ride back to the lodge but if you plan to do a one way hike from the Glacier Point area, then the one way tour ticket is what you need. The one way ticket cost $25 per person and the drive took about an hour and a half. On the trip up to Glacier Point the bus driver shared interesting facts about Yosemite and the various points of interest along the way. Once at Glacier Point we took pictures of the wondrous view before heading out on the trail. The trailhead starts at above 7000 feet elevation and is to the west of the viewing area. It starts with a short uphill section before leveling out and then making a gradual decline. Because of the unusual weather this year, with larger than normal amount of snowpack melting, there were areas of the trail that were wet and muddy. 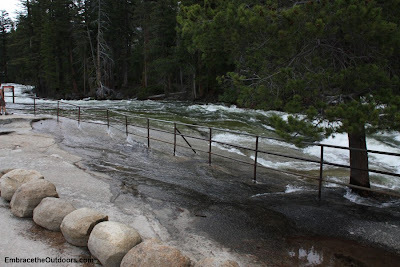 In fact, there were a few areas where you had to cross running water and had to be careful not to slip and fall. There are great views from the trail right at the beginning that continue throughout. The beginning of our hike was slow going since we frequently stopped to take pictures and were often mesmerized by the view. 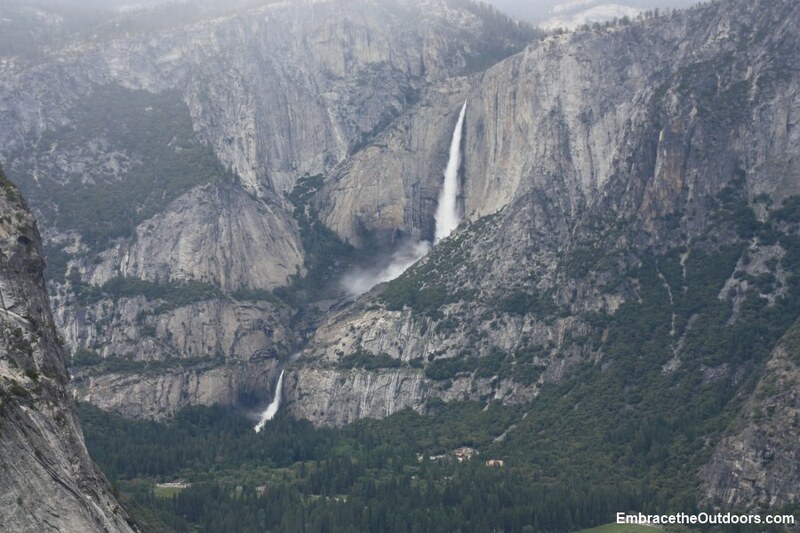 We got great views of Half Dome, Nevada Falls, Vernal Falls and Illilouette Falls. 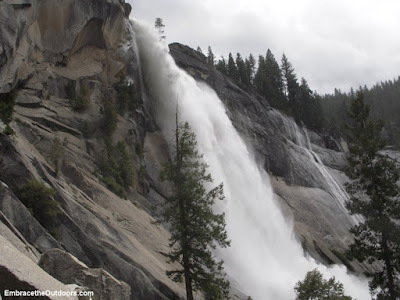 There is a very short detour to get good views of Illilouette Falls which lets you see that the falls was full with rushing water, as all the other falls we saw on this trip were. We soon got to the bridge that crosses Illilouette Falls and couldn’t help but stop to marvel at the water flow. As we crossed the bridge we began the uphill part of the hike. We came to Panorama Point which we had read would be a great lookout and one of the best parts of the hike but we thought the views at the beginning of the hike were better. We continued on the narrow dirt trail and came across the occasional muddy or rocky areas. Most of this part of the trail was shaded. 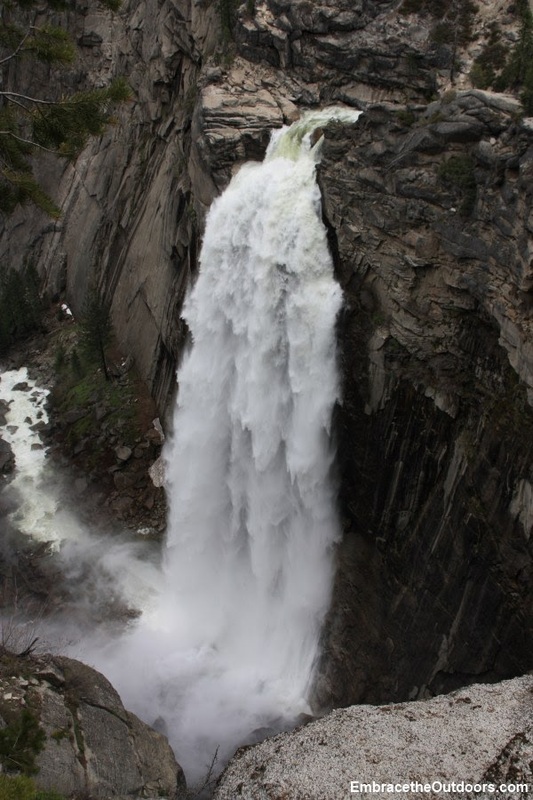 We made the climb along switchbacks for nearly 1000 feet before arriving at the top of Nevada Falls. Having made the trip up the Mist Trail to Nevada Falls several times before we weren't quite ready for the immense water flow. It was incredible, unlike anything we had ever seen before. Again we stopped for many pictures as we didn’t know if we’d ever be lucky enough to see the falls like this again. We took a rest break as well to re-energize and hydrate. The top of Nevada Falls is always a good place for a break. We had a choice to head down the Mist Trail or the John Muir Trail back to Happy Isles and Yosemite Valley. We had seen people that had come up through the Mist Trail with soaked clothing and many others with rain ponchos. We had packed in preparation for the Mist Trail so we headed down that way. After putting our jackets on we headed down the steep trail. When we’ve hiked this trail in the past we enjoyed the light mist that we would get from the falls after the initial dry rocky area but this time the moisture was more than refreshing…we got drenched! It was like rain was coming from all directions. We had to be extra careful on the steep, soaked steps. We tried to take pictures but couldn’t keep the lens dry long enough so we only managed a couple of shots when we were under the shelter of a tree. We continued down the wet trail and by the time we made it to dry land we were soaked from head to toe. Nonetheless it was a fun experience. We continued on to see Vernal Falls and again were impressed with the amount of water there. We had never seen it like this before. The trail nearly leveled as we crossed the bridge at Vernal Falls and made our way to Happy Isles which is at about 4,000 feet elevation. The total hike was about 8.5 miles and took 5.5 hours. 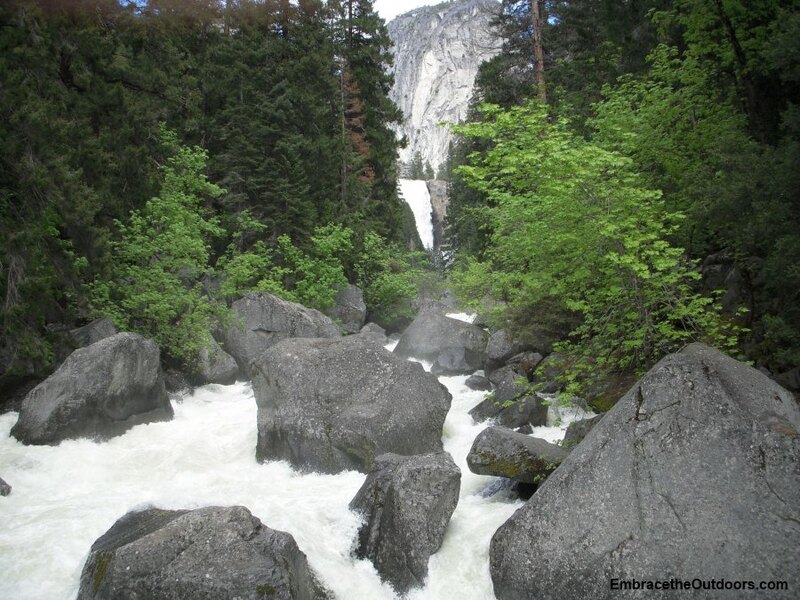 We would definitely recommend this hike, especially in spring when the water level is the greatest.